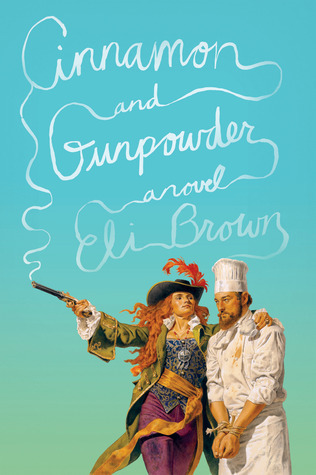 Cinnamon and Gunpowder is a novel about a chef who is kidnapped by a female pirate captain, forced to become her personal chef cooking a nice meal for her once a week, while she continues her obsessive pursuit of a mysterious individual and a vendetta against an evil corporation. The writing is authentic enough, feeling similar to Mary Shelley's Frankenstein in tone. That also means it is not necessarily very lively: Victorian writing tends to be quite wordy and not very streamlined. Just like Doctor Frankenstein, our hero is a rather whiny fellow. The story is told in diary entries, so many chapters start with a breathless "I can't believe I just survived these perils" type sentence - which tells you that he survives and that there is little need to worry or fear for our narrator's safety. The most notable thing about the story is that it reads like a complete gender inversion of a typical Stockholm Syndrome pirate romance tale. Dominant captain kidnaps verbally spirited, but physically weak and generally unwise person. Kidnap-ee plans their escape, verbally opposes the captain (by whinging, mostly), occasionally gets up to some mischief causing themselves problems and a bit of havoc on board, but is ultimately exempt from the ship's otherwise harsh discipline because the captain has a weak spot and keeps the weakling under their personal protection. Over time, the weak kidnap-ee develops feelings of loyalty and devotion towards the strong, dominant captain. Except this time, the weak kidnap-ee is a man, and the dominant captain is a beautiful red-haired woman. It's Mills and Boon, only backwards. I like the idea, but I found that it was often unconvincing: male leads are supposed to be protective of female protagonists. That's chivalry. When it's reversed, it is an inexplicable and alien favouritism that seems unconvincing and a bit wrong. Also, a female kidnap-ee on a ship full of men stands out because she is female (rendering her in more need of protection). A male kidnap-ee on a ship of men does not stand out and does not seem to warrant extra patience. Basically, it turns out a complete gender reversal just feels strange, forced, and unconvincing, even borderline unpleasant. Perhaps the dominant-character-kidnapping-weakling and weakling-falling-for-their-abductor plotline is a bit toxic, no matter what the gender assignments are. There is more to the plot - it also deals with the Opium Trade and British Imperialism etc. - so there's something quite educational about the story. The steam-punky obsessive captain in pursuit, with hot air balloons, rockets and crank-powered machine guns, on the other hand, seems much less authentic. In terms of swashbuckling adventures, there's plenty. Some beggar belief (a person survives without boat in the ocean for two days and is then, through dumb luck, picked up by another ship, which happens to be a very important ship to the plot...), but for the most part, the adventures are on a grand scale and just this side of believable.